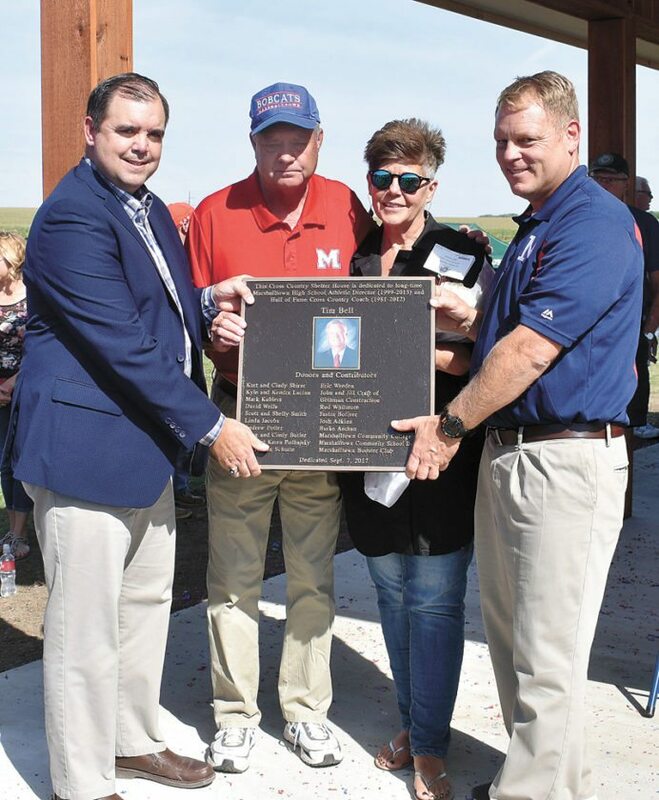 T-R PHOTO BY THORN COMPTON • Longtime Marshalltown High School boys’ cross country coach Tim Bell was honored Thursday during a dedication ceremony at the Marshalltown Community College course. Bell and his wife Deanna, center, pose with the plaque presented by MHS superintendent Dr. Theron Schutte, left, and project manager Eric Weeden. 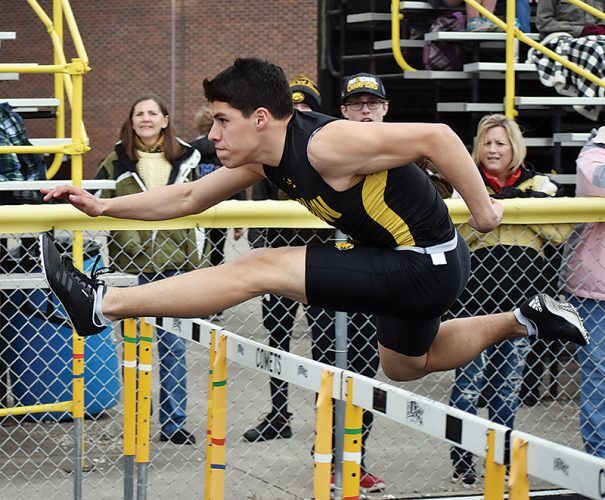 T-R PHOTO BY THORN COMPTON • East Marshall’s Cam Hungerford, front left, runs with a pack at the Bobcat Classic on Thursday at Marshalltown Community College. Hungerford led the Class 2A No. 10 Mustangs with a 56th-place finish in 17 minutes, 23 seconds. T-R PHOTO BY THORN COMPTON • Marshalltown’s Aida Almanza leads a pack of Bobcat runners during the 44th annual Bobcat Invite on Thursday at MCC. Almanza placed 85th in a time of 23 minutes, 4 seconds. T-R PHOTO BY THORN COMPTON • GMG’s Kyla Wilkening, left, and Waukee’s Isabelle Schaffer sprint toward the finish of Thursday’s Bobcat Invite in Marshalltown. Wilkening placed 28th in a time of 20 minutes, 9 seconds. 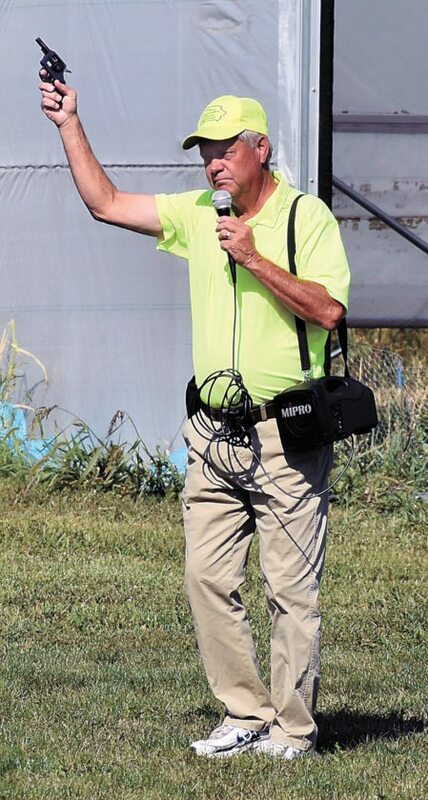 T-R PHOTO BY THORN COMPTON • Former Marshalltown boys’ cross country coach Tim Bell signals the start of the 44th annual Bobcat Invite on Thursday at MCC. Before the festivities of the 44th annual Bobcat Cross Country Invite got underway on Thursday afternoon, there was a celebration of the career and accomplishments of one of the great Bobcats to don the blue and red. Tim Bell, an MHS alumni, coached the Marshalltown boys’ cross country team for 32 years and served as athletic director for 13, all the while amassing an impressive resume as a head coach. His teams won 128 total overall meets, he made 25 state championship appearances — including 18-straight years — and he was named Iowa, Regional, and Conference coach of the year on separate occasions. He had three state runner-up finishes, three state third place finishes and three individual state champions in his tenure, including a new state record set in 1999 by Grant Shadden and a tie of the state record by Stephen Dak in 2006. 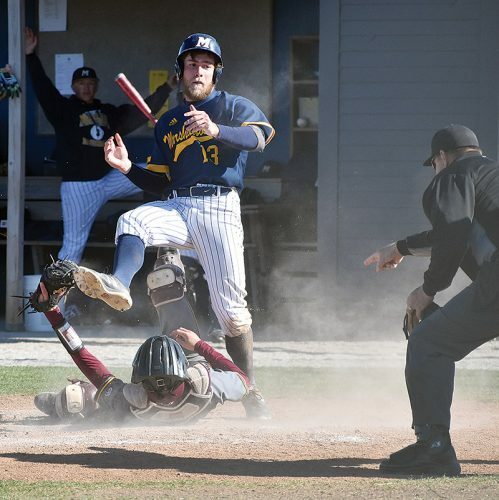 Bell’s teams finished unbeaten against 147 teams across the state in his 32 years head to head, and he owned a staggering 80 percent winning percentage in head-to-head matchups, going 2391-470 in his career. Current and former Marshalltown runners and people Bell touched throughout his time at the school all gathered around in front of the Marshalltown Community College course on Thursday for a dedication of the new shelter house at the course, which will have a plaque honoring Bell set into a rock for generations of Bobcats to view and learn about the MHS legend. Bell, who was overwhelmed with emotion more than once during the ceremony, said what he will always remember isn’t the accomplishments and achievements of his team’s, but the individuals he had the honor of coaching. Before taking over the position back in 1981, Bell said he received a word of advice from a family friend about how to get the best out of his runners, and it served him well throughout his time with the Bobcats. That was clearly the case, given how many of his former runners and students were in attendance during the dedication. Bell walked up to all of them and remembered each face, laughing throughout the festivities and sharing smiles with both his former runners and his family, who joined him under the new shelter house during the dedication. One of those former students, Eric Weeden, actually built the structure honoring the great coach, putting both his time, effort, and funds towards creating the new shelter house. Weeden said it was because of what Bell meant to both him and the Marshalltown community that he gladly built the structure in honor of the man. Current Marshalltown girls cross country coach Stacy O’Hare was coached by Bell in girls track, and she said watching the dedication and seeing all the faces that showed up to pay homage to the legendary coach was heartwarming. Bobcats boys cross country coach Chad Pietig, Bell’s successor, said though he didn’t graduate from MHS, he has learned a great deal from Bell in his time as a Bobcats coach. Now that his legacy is quite literally cemented into the ground at the Bobcats’ home cross country course, Bell said a lot of what he set out to accomplish as a coach and athletic director came to fruition, though he did aspire to make the course a home for the state meet when it was moved to MCC from the Iowa Veterans Home. He pointed to the development of the Bobcat Invite as something he is proud of, as it grew from humble beginnings to one of the largest cross country events in the state. “We’ve built this meet up, the first year I think we had like six teams and now it’s been built up to where it’s one of the premiere meets in the state of Iowa,” he said. Ultimately, Bell said one thing drove him throughout his career, and that was to see the Bobcats program that he ran for as a student succeed and prosper. “The most important thing to me is, go Bobcats!” he said.